Working on addition? 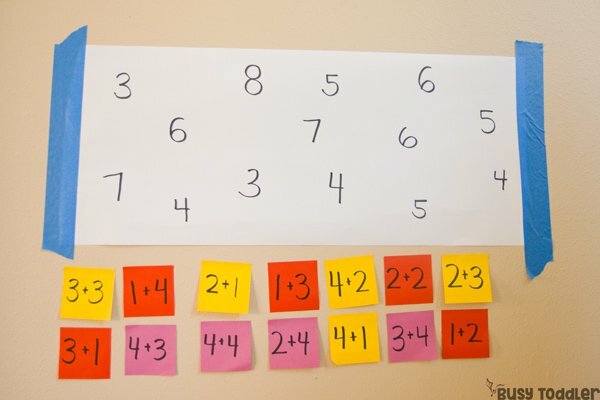 Make this Post-It Math Activity! Guess what? 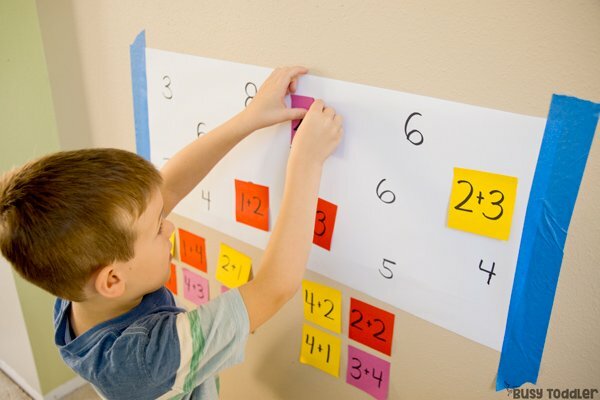 You don’t need a worksheet to practice math facts! 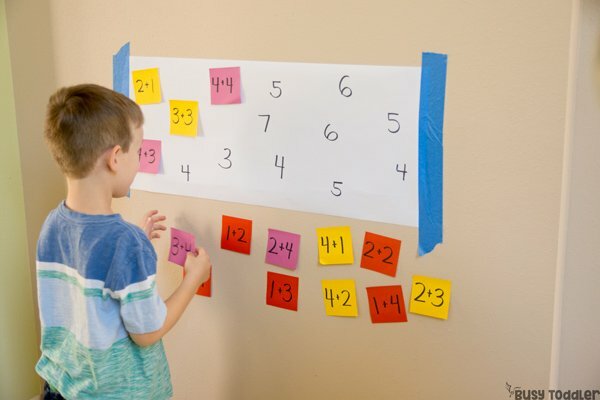 I know math worksheets and printables are all the rage right now, but here’s a hands-on alternative to get your learner moving! 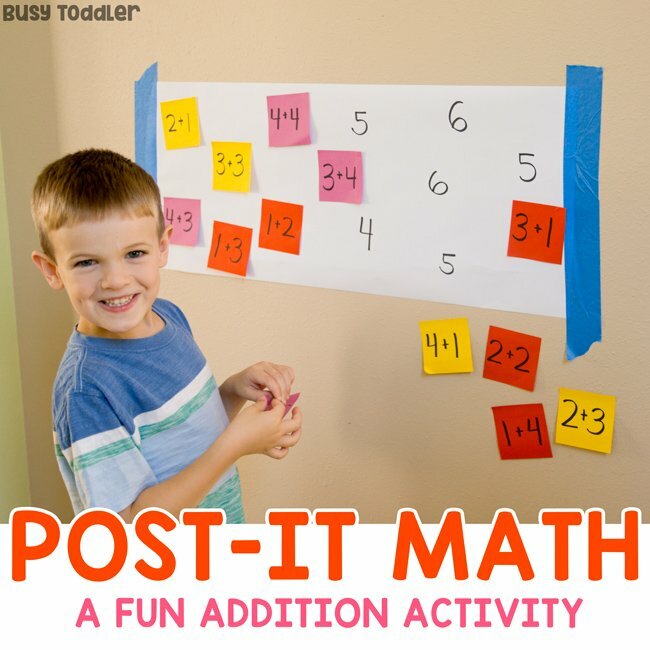 This Post-it Math activity is WHERE IT’S AT! Kids need to be active in their learning and this gets them moving. 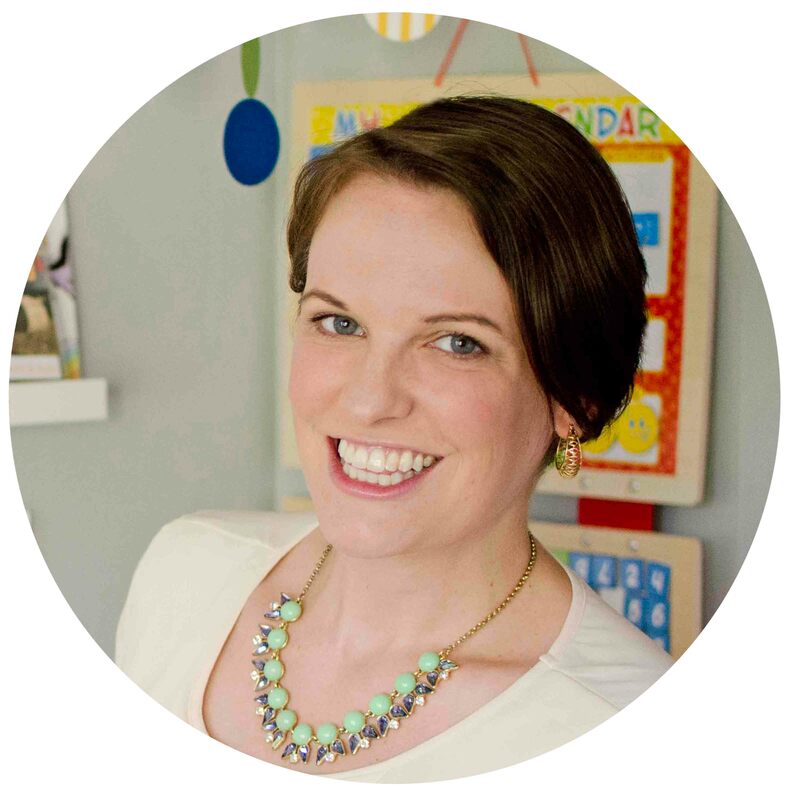 RELATED: Are worksheets good for kids? It’s a simple answer: No. 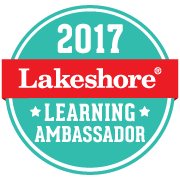 Read more about my thoughts on worksheets here. What’s going on in this math activity? This is a mental math activity working on small addition facts. I’m not looking for quick and rapid recall of these facts, but for my son (5) to be able to use his head or his fingers to solve the problems. When I talk about math facts like this, I’m using the word “and” instead of plus. Why don’t I say “plus”? Because I want my son to understand what’s happening in an addition sentence. We are joining two numbers together. So I phrase the sentences with “and”. 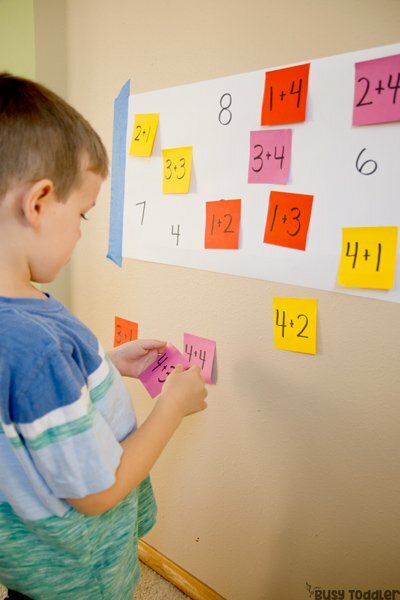 I want my son to hear those words in his head whenever he sees an addition fact – remembering exactly what the process is. We are joining the numbers to make more. 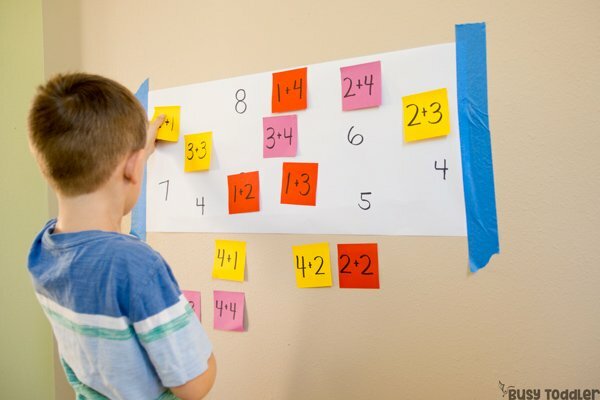 The more conceptual we can get with our kids, the more we can explain the process and the “why” behind math, the better their grasp of numbers will be. I started by writing out my equations – I chose to use addends less than 5 to make the sentences easier for my son to work with. Since the goal is for this activity to be done with mental math or using fingers, I wanted to keep the numbers small. 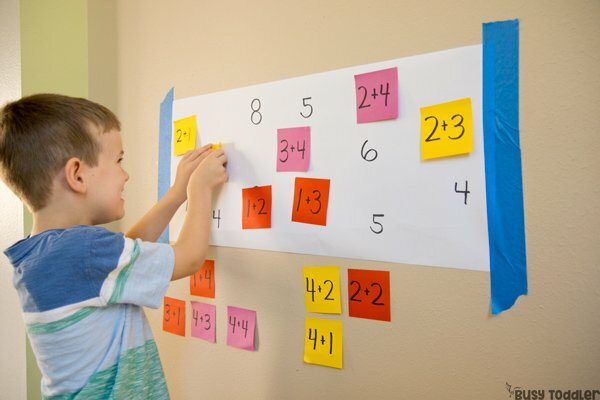 The idea is for him to find ways to solve simple math problems without the use of counters – just using what he has on him always: his mind and his fingers. As he progresses in math, he’ll start to memorize these facts. That’s not what today is about. Today is about practicing these math facts and working on solving them. On the Post-it notes, I wrote the number sentences. Then, I wrote the sum of each equation on the white paper. My son’s job was to match the number sentence to the correct sum. In fact, this was a great chance to remind him to work slowly and take his time. Mistakes get made when we rush through our learning. Oh you could see those wheels turning in his head as he worked through each problem! Mental math is a SKILL! And it’s one that has to be grown and developed. By taking away counters and manipulatives, it forced my son to come up with mental strategies and other ways to solve these problems. 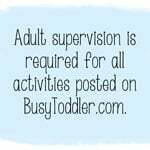 Plus it lets him work in a hands-on way, which no worksheet can offer him! 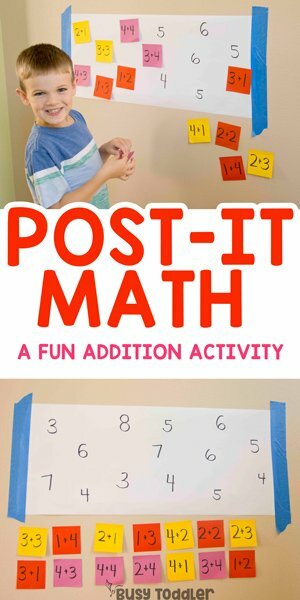 Let’s get active with math! 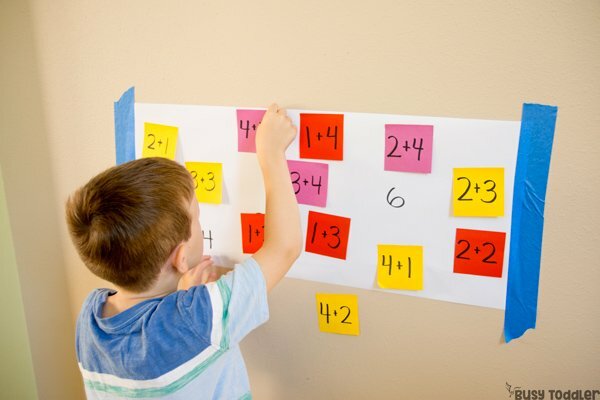 Making this Post-it Math Activity was a slam dunk – and a way to get my son moving with math. When our kids do worksheets, they sit and try to find the right answer. When they do an activity like this, they really come alive with their learning. 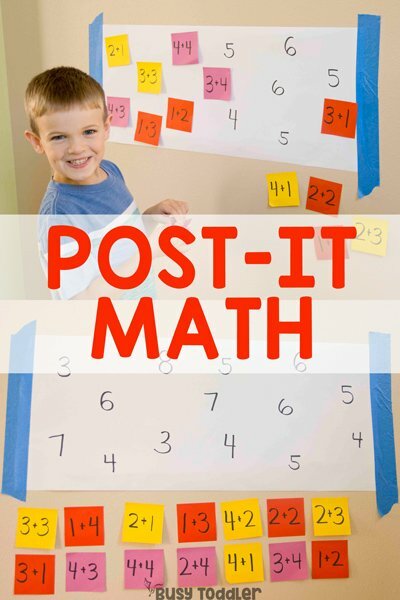 When will you make a Post-it Math Activity?